Pictures in Glass Frames includes personal anecdotes that encourage readers to honor Christ daily, love unreservedly, and live purposefully. 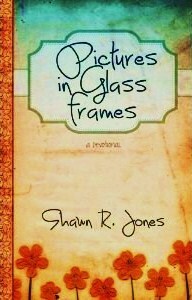 Readers will laugh, cry, and praise God as Shawn R. Jones candidly unfolds her life story. This devotional reveals the intimate details of Jones’s tragic family history and restored adult life. It describes a lineage that is misshapen by domestic abuse and addiction, but most importantly Pictures in Glass Frames celebrates a life and present generation saved by God’s grace. As Jones discloses the situations in which her faith has been challenged and restored, readers are encouraged to trust God with the difficult circumstances they face in their own lives. With Christ at its center, this heartfelt collection inspires, revives, and restores as the author conveys her central message: metaphorically, we are all pictures in glass frames; physically, we are innately human; spiritually, we are eternal. Personalized signed copies can be purchased from my website: www.shawnrjones.com It is also available at Barnes and Noble stores, multiple websites (i.e. amazon.com) and on the Nook, Kindle, and itunes. Shawn and I attended high school together; we had many of the same classes. Shawn always was known for her kindness, intelligence, good humor and extreme talent. One of a kind and always humble- although so so so very gifted! It was always a pleasure to be in her company. Flash forward twenty-five years and I am honored once again to have Shawn back in my life- at first on a socal level via Facebook and then last year at a high school class reunion; and now- a true blessing having purchased a copy of one of her books. Shawn’s devotional book has spoken to me in such a deep way that I am so very fortunate to have my hands and eyes on it. Let’s just say, this book has come to me, just at the right time. Even though I was raised in the Jewish religion and was not taught to pray to Jesus per se, being a deeply spiritual person I can relate 100% to the writings. They speak to me on a soul level. I am embracing the quotes from the Bible in a new and honest way. I have taken the “advice” and guidance from Shawn’s writings and applied it to my daily life; I am here to attest that said writings are helping me to work through some of the challenges I have been faced with lately and perhaps my entire life if I want to be really honest. I have always intended to do things in an upright, positive fashion and yet, I know there are always lessons to learn and ways to grow. Shawn’s writings have helped me master and have power over some of the “demons” that I was still struggling with and finally put them to rest by using her practical suggestions. This is the type of book that should not be read once. Once I have read over the entire book (currently I have one-third left) I plan to leave it next to my bed and will re-read it. I do not plan to re-read it from front to back. I do plan to allow the universe to speak to me once again via Shawn’s writings by trusting that when I randomly flip to a certain page, that it will be just the one I am meant to read for that evening. If that makes any sense. As I believe that the universe will bring me what I need to read and/or learn at any particular time- just like the universe brought Shawn’s Devotional book to me, in the first place- just when I needed it most. So, Shawn, from the bottom of my heart, I thank you once again. Joy…thank you so much. You and I made a special connection in high school years ago. We have a relationship that transcends religion and race, and am so very grateful for it. You have inspired me in so many ways with your kindness, your uniqueness, and your honesty. I know I can’t get that from everyone. There was a time when I thought I could, being young and overly optimistic. So, when someone like you comes a long, I cherish the friendship deeply. I wish I could continue to write past the emotion I feel. I wish I could write it in a poem or perform it in a dance for you. The feelings are too fresh now, as I am so touched by your sincerity. Please know how grateful I am.